With energy prices rising, consumption increasing and supplies under threat, there are both environmental and financial reasons for all potential customers to consider their present and future energy use. Avoiding the needless waste of energy already produced is by far the most cost-effective way to boost overall energy efficiency and reduce energy losses. The insulation used in Maincor’s Flextra pipe systems is polyurethane foam (PUR) of the best quality. Used in conjunction with high-efficiency continuous manufacturing processes, this makes it possible to achieve a PUR-foam with exceptionally small cells, thus improving heat retention performance. 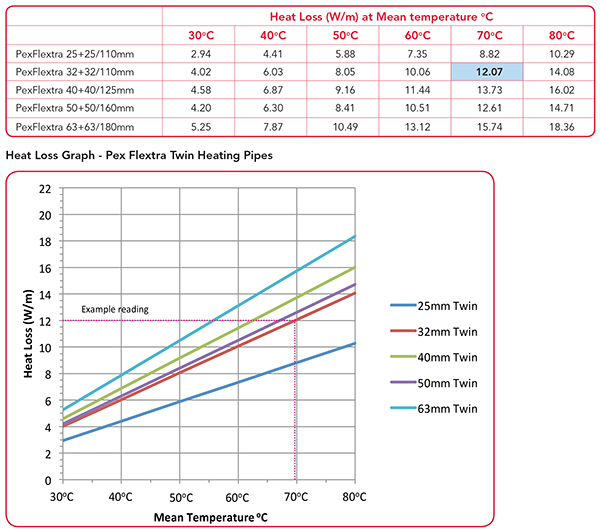 The average lambda value of Flextra Pipe is 0.0207 W/mK (the lambda value is used to identify a material’s ability to limit energy loss and is the parameter used when calculating heat loss for pre-insulated pipelines). The very low heat losses improve energy efficiency and system performance, and contained within the outer casing is a unique EVOH barrier ensuring the insulation properties remain constant over the entire life of the pipe. To calculate the mean temperature, add the flow and return temperatures and divide by 2.